We all know that when you’re fired or laid off from a job, you can’t take it all with you. You’ve got your pictures and the tschotskies you have on your desk, and that’s about it. Your memos, your business practices, even the very files on your computer might belong to the company and not to you. That’s the company’s intellectual property, not yours. Even if you came up with it yourself, any “innovations” belong to your boss. If you have a particularly draconian boss, you might even have a security guard assigned to watch over your shoulder to make sure you don’t make off with anything you shouldn’t. But there is one resource they can’t stop you from taking with you. It’s YOUR intellectual property, and lucky for you, it’s the most valuable thing you can walk away with. Yes, I’m talking about your contacts. The people you know, the connections you’ve made and nurtured… even the a client list. No one can stop you from jotting down someone’s phone number or email address. And your list of contacts is the most valuable resource you’ll have for getting a new job. Even contacts at competing companies. I won’t belabor the point again, but yes, networking is the best way to find a new job. And the best network of contacts you have is your list of work contacts. So if you feel a layoff coming, take a piece of paper out and transcribe all the entries in your inbox and address book. 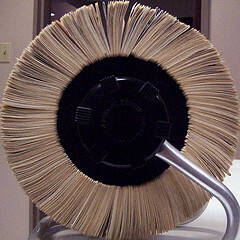 If they’re walking you out the door and you grab for nothing else, grab for your rolodex. It’s funny, but I was blogging about this just a couple of weeks ago. One thing I would add to your post here is that, if you use Microsoft Outlooks for your contacts, export them frequently and take them home on floppy or on disk. Don’t e-mail them to yourself, though. I found to my dismay, that Outlook can be set to strip the information from your address book files when you e-mail it. I lost a good number of contacts that way. I e-mailed them to myself on my last day, and by the time I realized it had stripped the data from the file, my access had been cut off. To be on the safe side, I usually export to Excel, just incase the next job isn’t using Outlook. Most modern e-mail readers will import contacts from an Excel spreadsheet if they don’t from Outlook files. This is absolutely spot-on. When I was “let go” a couple of years ago from a small printing company, a couple of the contacts I made were able to find me more work. My recommendation: use Plaxo to keep your contacts synchronized regularly. At the site, you superimpose your face on a variety of compromising images to then e-mail them to your friends (or boss). You can also peruse some humorous work stress tips. Pingback: Getting Fired? Laidoff? What About Your 401 k? If you added doolars to your 401 all year then they lay you off in Dec of the same year are you do the match that they add in March ?